Parents want the best for their children. Having to watch them struggle academically, socially and behaviorally can be emotionally painful. Once your child has been identified as having a problem and a formal diagnosis or label is given, the question becomes what to do treatment wise. For parents of an ADHD child the only solution typically given is stimulant medication. Most parents innately know that the medications are not getting at the root cause of the problem, but unfortunately, in almost every case they are not given another approach. When it comes to doing the best for your child, it is important to fully understand all of your treatment options. In helping a child or teenager with a neuro-developmental disorder such as ADHD it is essential to address the underlying cause of the disorder. 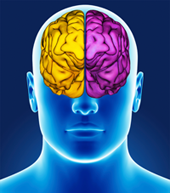 As Functional Neurologists we know that a properly functioning brain requires communication between both hemispheres. This communication via nerve impulse within the brain should occur very fast. In children with neuro-developmental disorders this communication is slow or out of sync. This miscommunication between the two sides of the brain is called Functional Disconnection Syndrome and is the root cause of many childhood neurodevelopmental disorders. When the brain is out of sync and there is poor communication between the two hemisphere there will be learning, behavioral and social problems. The term “functional” means that the problem is not structural and the brain is not diseased or damaged — it is simply not developing as it should. This developmental lag may cause one brain hemisphere to be out of sync with itself or with the hemisphere on the other side. It is unfortunate, but typically, when a child is evaluated due to a learning, behavioral or social disorder, they undergo minimal neurological examination and are usually given a label as having a disorder such as ADHD, a learning disability or autism. The majority of these concerns such as ADHD, learning disabilities, reading disorders, OCD, Autism, Tourette’s Syndrome, Asperger’s Syndrome and sensory processing disorders are caused by Functional Disconnection Syndrome. These conditions can be caused by either a left brain deficit or a right brain deficit. For example children or teenagers struggling with ADHD and poor focus typically have a Functional Disconnection Syndrome affecting their right brain. The majority of the Autism Spectrum disorders such as ADHD, Asperger’s Syndrome, PDD-NOS and even OCD are right brain deficit problems. ADHD is a less severely involved right brain disorder as compared to autism. In ADHD, many times just one region such as the right dorsolateral pre frontal cortex is involved, where in autism, many regions of the right brain may be involved. Problems such as dyslexia, reading disorders, learning disabilities and poor handwriting are typically caused by left brain deficits. In order to fully understand these neurodevelopmental disorders, Its essential to look at them in terms of “hemispheres,” or sides, of the brain. When we understand what each side normally does for a child when they are in balance (integrated), we can understand what goes wrong when there is an imbalance (functional disconnection). One may ask why are there language delays in Autism if it affects the non- dominant non- verbal right hemisphere? The Right hemisphere is responsible for non-verbal communication whereas the left hemisphere is responsible for verbal communication. Non-verbal communication is the foundation of verbal communication. One must first have non-verbal communication such as understanding one’s feelings,facial expressions and body language before verbal communication develops. Essentially the non-verbal precedes the verbal. If a child has a right brain delay, they never develop these and the functional disconnection inhibits communication of the right non- verbal with the left verbal. Without these basic pillars of communication, appropriate verbal communication is delayed. One method to encourage appropriate speaking in these children is to work on building the foundation—non-verbal communication which is the right brain. Why are there so many “sensory” problems with these children? Often the problem is with the frontal lobes and inappropriate withdrawal responses to the sensations. We look at each specific brain region that could be affected. In addition, we also examine the child or teenager’s specific functional capabilities and the neurochemical components as well. This is different from just using parental questionnaires and generalized batteries of tests, and quick observation to make a diagnosis or assign a label. That approach does not look at various areas from a functional neurological model. The traditional treatment option of medications do not take into consideration the issue of HEMISPHERIC IMBALANCE and which side of the brain needs more stimulation? Right or left? They also do not look at the specific areas of that side such as the parietal lobe, the temporal lobe, the frontal lobe or the cerebellum. We are also very concerned about knowing the individual child’s brain metabolic capacity or endurance. How much therapy can they handle? What is too much? What is their neurologic stamina? We don’t want to over stimulate or exceed the child’s metabolic capacity with our therapies. This approach is very individualized . We determine all of this in our examination. Medications affect the brain globally as a whole and are not specific or able to bias certain neurological areas. It is not possible for a chemical to only affect the specific areas of the brain injured by the concussion and not the non-injured areas. For example, if only the left side of a person’s brain stem is affected causing dizziness and poor balance, how could the chemical action of the medication only affect one side and not the other? It is for that reason we do not use medication and instead use specific brain stimulations to train and repair the specific areas affected by the concussion. The most current research is supporting this approach. In order to better understand this Methodology it’s important to understand how a Functional Neurologist differs from conventional medical neurology. The key difference between a Functional Neurologist and a conventional medical neurologist lies primarily in their approaches to treatment. A conventional medical neurologist is typically focused on the diagnosis of structural pathology and utilizes only pharmaceutical and surgical interventions to treat disease. A Functional Neurologist views the nervous system as a moldable, changeable entity that can be affected in its function through virtually unlimited types of environmental stimulation and specific therapies. This concept of the brain being able to change its function throughout life via environmental stimulation is termed neuroplasticity and is at the very core of a Functional Neurologist’s clinical methodology. Medications do work at suppressing the symptoms, but they are not addressing the root cause and can cause unwanted side effects. According to the FDA and the National Institute of Health Ritalin is associated with a 500% increase of sudden cardiac death. Proper sensory and motor development is essential for proper growth and development of your child’s brain. Your child’s interaction and experience with the world provides the sensory and motor stimulation required to build and develop their brain. The brain develops from the bottom up — from the brain stem up to the cognitive cortical centers of the brain. When a baby is born, their brain stem is the primary area of their brain that is developed and functioning. The higher level cortex has not yet developed. The brain stem controls all internal organ functions and causes movements that are primitive and purely on reflex such as hand grasping, sucking and rooting. With proper neurologic development these primitive reflexes governed by brain stem activity should be remediated or inhibited and hidden. Sensory stimulation such as hearing, vision, touch, taste, smell and inner ear or vestibular begin to develop the sensory areas of the brain. The sensory stimulation provides feedback to the lobes of the back of the brain to drive and build them. The next developmental milestone is motor and frontal brain development where movement of the legs and arms, pushing up on the belly, eye tracking to follow objects, voluntarily grasping objects, rolling over, pulling up, crawling and walking occur. The motor system drives the sensory stimulation leading to the next stage of development: sensory motor is when body awareness, reaching for particular objects, postural security, and motor planning develop. Next is perceptual motor where language skills, spatial awareness, eye hand coordination and ocular motor control develop. The last stage of development is cognition when attention/focus, behavior, social skills and academic learning occur. These stages are the basis for developmental milestones that we use to determine how our children are growing. Delays at any level can cause altered development of the following stages leading to issues in attention, behavior, academic learning and social skills. With the traditional care of tutoring, counseling and medication, ADHD, Autism and learning disabilities are evaluated and treated at the top of the pyramid in an attempt to address the cognition, social skills and attention and focus directly. The problem is that ,without developing a strong base, it is virtually impossible to correct these problems from the top. If there is a problem in the bottom or middle stages (such as an infantile reflex that is still persistent, a sensory development issue, an issue with proper cross crawl mechanism, improper oculomotor control, poor eye tracking or other aspect of the early development), then the later components such as attention/focus, language skills, behavior, social skills or academic learning will suffer and not function properly. This hierarchy of development supports a bottom-up strategy including sensory motor therapies to go back and work areas that may not have been fully developed. Before any higher learning, behavioral, attentional, social or academic improvements can take place, there must be improvement in motor skills and sensory processing. Almost every child with a brain imbalance causing a neurodevelopmental disorder will also have issues with their motor skills making them clumsy, uncoordinated and awkward. In some cases this can be obviously seen in their gait, posture and gross movements. In other cases it is very subtle and only seen in the smoothness or accuracy of their eye movements. Other motor activities that can be affected are: vestibular (balance), posture, eye movements, primitive reflexes, fine and gross motor skills, handedness, muscle tone, rhythm and timing and strength. Also abnormal processing of sensory stimuli from hearing, vision, smell, taste, touch, vestibular and spatial perception can cause a child with a brain imbalance to react abnormally to these stimuli causing poor behavior. The advanced neurological testing procedures listed below allow us to pinpoint brain impairments that may be responsible for your child or teenager’s neuro-developmental concern. Most children 6 years old and over have no problem having these computerized oculomotor tests performed. In fact most think the goggles are pretty neat. Some younger children or those with more advanced autism or sensory issues may not have these tests or others performed. In those cases we rely on the bedside neurologic examination testing. 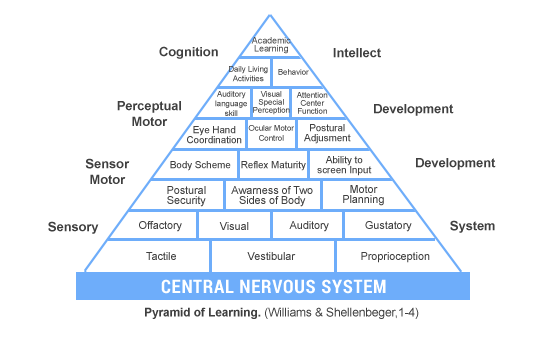 VNG is a computerized system used in the assessment of the oculomotor system (nervous system control of eye movement) and the function of those areas of your brain controlling these movements. The VNG test is comfortably performed in our office. 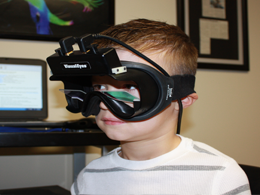 We simply place special goggles with an infrared camera on your child or teenager’s head to record and measure their eye movements in both light and dark conditions. Specific areas and pathways of your child’s brain are activated during different types of eye movements. 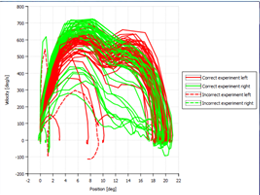 During the test, computer software is recording and graphing their precise eye movements as they follow a visual target with their eyes. By measuring their recorded eye movements and displaying them on the computer screen, we can see how they compare to normal measurements. Specific areas and pathways of the brain are activated during different types of eye movements. During the test computer software is recording and graphing your precise eye movements as you follow the visual target with your eyes. By measuring your recorded eye movements and displaying them on the computer screen you can see your own eye movements and how they compare to normal measurements. Gaze Stability: It is essential that the brain stabilizes the gaze of the eyes for proper focus and attention as well as motor coordination. One of the most common ocular motor deficiencies seen in neuro-developmental cases is poor gaze stability. This can be seen on the VNG tracing. Pursuits: Pursuits are slow and steady eye movements that allow you to track a moving object. Good, smooth pursuits are essential to everyday functions but are particularly important in the mechanics of reading. When a patient reads the line of words in a book they are using their pursuit mechanism. The smoothness of the pursuit mechanism is commonly altered in neuro-developmental disorders. Saccades: Saccades are fast eye movement used to shift a person’s gaze from one object to another. Saccades are generated by the frontal lobes of the brain. The frontal lobes are important in executive functions such as attention. A child’s saccades can be evaluated to determine their level of frontal lobe development and function. Saccades need to be fast and accurate. Saccades are also used in reading when a person shifts their line of site from one line they are reading to the next. If the saccades are not accurate this can affect a child’s ability to read. 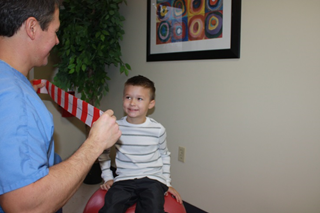 Vestibular Ocular Reflex: When you child moves their head their eyes should move equally in the opposite direction if this reflex is functioning properly. This reflex is poorly developed in children with neuro-developmental disorders. The VNG eye movement tracings provide invaluable neurologic information concerning specific areas of your child or teenager’s brain. We are experts at analysing these specific eye movements and determining if they have been developed properly and are functioning properly. We correlate the VNG findings with our other testing and examination procedures to develop a specific therapeutic program for each individual child. We also measure your child’s saccades using saccadometry. As described above saccades are quick movements of your eyes that allow you to voluntarily move your eyes quickly from one object to another or to react by moving your eyes to a suddenly appearing target reflexively. Saccades can also be measured using a device called a saccadometer. The saccadometer measures different aspects of the saccades than the VNG measures. 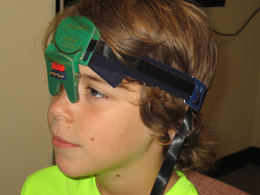 The saccadometer is strapped around your child’s head using an elastic headband. Within the unit, there is a laser that projects targets onto the wall that a patient will look at quickly or saccade to. The saccadometer will measure the eye movements at the same time. Studies have shown saccadic testing to be a very accurate way to detect areas of improper brain development and function. This test cannot be altered voluntarily by the patient because you cannot consciously control the speed of your eye movement during each saccade; your eyes move as fast as they can. The purpose of your saccadic eye movement is to aim the part of your eye with the best vision (fovea) at the thing you want to see most, and then hold your eye there as you examine it. Saccades are the only human physiological function that use every area of the brain. It is for this reason that we can evaluate a person’s saccades to determine what areas of the brain are not functioning at par. Some of the brain areas used in controlling saccades involves three main brain regions: the frontal eye fields, the parietal eye fields, and the supplementary eye fields; and several subcortical areas in the basal ganglia, thalamus and brainstem. These areas are commonly not developed as well as they should be in children with neurodevelopmental disorders. Latency: This is the reaction time taken for the saccade to fire or activate after a new stimulus or target is presented. A normal reaction time should be less than 200ms. Velocity: The speed of a saccade is highly related to health of areas in the brain stem commonly affected in neurological disorders. Accuracy: The ability to make the eyes stop and land directly on the target they are saccading to or looking toward is essential to a person functioning in their environment accurately. If the saccade overshoots or undershoots the target it may indicate that the cerebellum or the area of the brain that makes the environmental grid may not be functioning so well. The saccadometer computerized graph shows leftward saccades that are generated by the right brain hemisphere as red and the rightward saccades that are generated by the left brain as green. This can be very useful in determining what side of the brain is out of sync. Interactive Metronome (IM) diagnostic testing We use interactive metronome long and short form diagnostic testing to assess a child’s focus, timing and ability to coordinate visual and auditory stimulation while doing a gross motor skill. IM is an assessment and treatment tool used by therapists and other professionals who work with pediatric and adult patients with neurological conditions that affect cognitive and motor functioning. IM provides an objective method for measuring deficits and for tracking improvement. IM is an evidence-based and engaging therapeutic modality that improves cognitive and motor skills. The design of the program ensures that patients recognize progress as it occurs, increasing their motivation toward therapy and their ultimate recovery. Children with brain imbalances tent to be poor eaters. This is because having a functional disconnection causes them to be particularly sensitive to the flavor and texture of food causing them to be fussy and finicky. They also tend to always want to eat the same foods over and over, and frequently, these are the foods to which they are highly sensitive. This can cause poor digestive health and nutritional deficiencies. The brain controls the digestive system and the immune system. When the brain is out of balance, the digestive system and the immune system do not function well. A weak brain will create an underdeveloped and weakened digestive system. 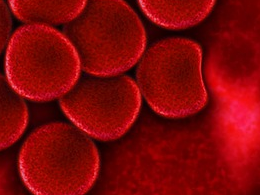 causing an opening of the tight junctions that divides the intestines from the blood stream. This is called intestinal permeability or leaky gut. A leaky gut allows undigested proteins to enter the bloodstream causing the immune system to become hyperactive and triggering bodily inflammation. This inflammation can cross over and inflame the brain too. Brain inflammation can cause the poor brain function seen in children with ADHD and other neurological problems. This becomes a vicious cycle. There are specific dietary recommendations and nutritional supplements that can improve a leaky gut and reduce this brain inflammation to support a better environment for the brain to function. We combine these evidence-based, drug-free dietary recommendations and nutritional supplements with our specific brain therapies to achieve maximal benefit for children and teenagers in our program. We will customize a simple step by step nutritional program that will be easy to fit into your child’s life. Preliminary Lab TestingThe effects of a concussion can be compounded by the person’s metabolic health prior to the injury. Inflammation Testing: We test for Inflammation in your system by testing Homocysteine Levels and C – reactive protein (CRP). We can assess your child’s thyroid, adrenal, immune, blood and gut function. All can be affecting their brain health and function. By addressing any problems with their thyroid, adrenal glands, immune system, blood chemistry or gut function, we can help their nervous system to function more properly. The complete metabolic panel allows us to check their blood glucose levels since glucose and oxygen are needed by the brain to function properly. Cyrex array 2-Intestinal permeability (Leaky gut testing)Many children have a microscopic breakdown of their intestinal wall known as intestinal permeability that may be a result of poor brain function or a poor diet. This breakdown, called leaky gut, will cause the small intestines and colon to become inflamed as well as allow the brain to maintain its inflamed state. An inflamed gut will cause an inflamed brain. Cyrex Labs specialized immune testing for intestinal permeability will determine if you have leaky gut and, if so, what specific type. There are 3 types of leaky gut, each have a specific treatment approach. The Gut-Brain Connection:The gastrointestinal system is known as the “Second Brain” and has just as many neurons as the brain itself. Our 2 brains- the one in our head and the one in our bowel- must cooperate. When they do not, then there is chaos in the gut and misery in the head-everything from “butterflies’ to cramps, from diarrhea to constipation. Cyrex array 3- Advanced gluten sensitivity testingA large number of children with neurodevelopmental issues are also gluten sensitive and may have excess gut and brain inflammation from gluten sensitivity. This can compound and multiply the inflammatory cascade affecting brain inflammation. Adrenal Stress Index (ASI)We can further test your child’s adrenal glands. The adrenal glands are the “stress” organs, meaning that they react to stress by creating cortisol. If your child suffers with anxiety, tends to be more stressed or is taking stimulant drugs, their adrenal glands may be affected. When their body’s cortisol levels are abnormal, it is a sign that their body’s sympathetic nervous system is over-firing. Abnormal cortisol levels can be corrected via specific neurologic and nutritional protocols. Specific diet and supplement protocols for leaky gut correction. Specific diet and supplement protocols to decrease brain and gut inflammation. Nutritional protocols for abnormal adrenal (stress gland) function. Diet recommendations to reduce hyperactivity. Natural neurotransmitter support to improve focus and motivation, reduce anxiety and improve sleep. For information about our ADD, ADHD Evaluation, Neurological Exam and Report of Findings plus details about our full length ADHD Video and Report, put in your information below and we will email it out right away. Only your name and email is required.